Women are very busy these days, rushing, trying to make everything on time. Mrs Inga in Thurrock was ironing her husband’s shirt, rushing to go to Lakeside shopping centre, when accidentally dropped iron from 1m height, it landed on laminate wood flooring. 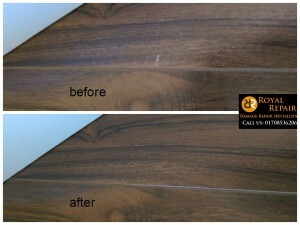 ANY Chip or scratch in the middle of floor can be repaired by our Damage Repair Experts. To replace wooden floor board in the middle of room is impossible, because floor is like puzzle and you can’t take one out in the middle, but no worries. We provide cosmetic repair to any damaged surface. Inga couldn’t find dent after damage repair specialist fixed it, could you?